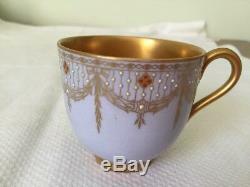 1915 Beautiful Antique Beaded And Gilt Jewelled Royal Worcester Demitasse. 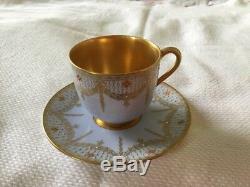 An early 20th Century Royal Worcester teacup and saucer, the beautiful pale powder blue ground set with enamelled jewelled decoration, and the interior cup, handle and middle of saucer lavishly and thickly gilded. 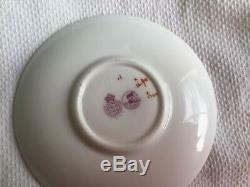 I have spot dated both the cup and the saucer to 1915 together with a further puce mark of a barge on water. This cup and saucer is so exquisite that no photos of mine could fully capture it. I have tried very hard to give an idea of the beauty of the colours and exquisite coloured beading/jewelling. 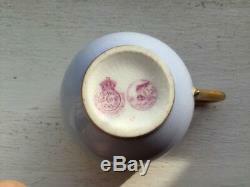 This cup and saucer is of rare and great quality and were specially made by Royal Worcester for a very rarified customer. 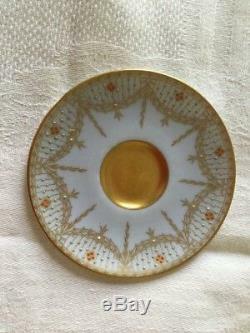 The porcelain is very fine, the lavish gilding perfect (no defects). Above all is the beauty of the pale powder blue and the quite exquisite pearl, red and green beading - like jewels. 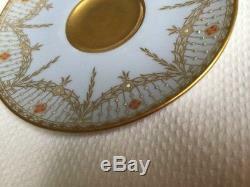 The rim of the saucer has red and green beading as well as pearl. The cup has red and pearl beading/jewelling. 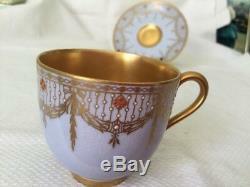 The interior of the cup, and the handle, and middle of the saucer are most lavishly gilded, the gilding being in fine condition. Please view the photos carefully - there are no visible defects of any sort to this pair and there is no chipping, mendages, cracking etc etc. 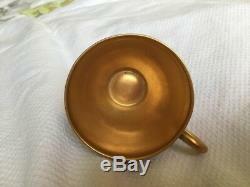 Saucer is approx 9.5cm in diameter whilst the cup is about 4.75cm height. 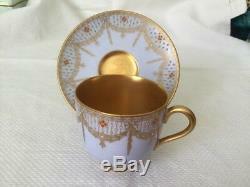 The item "Fine Antique Beaded & Gilt Jewelled Royal Worcester Demitasse Cup Saucer 1915" is in sale since Monday, December 24, 2018. 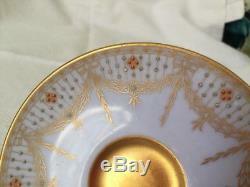 This item is in the category "Pottery, Porcelain & Glass\Porcelain/China\Royal Worcester\Decorative/Ornamental". 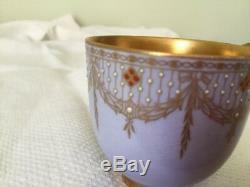 The seller is "2012chantry" and is located in London.